The Folly Wood project is managed by the Forest of Marston Vale Trust and covers 30 acres of land, just a few miles from the new Center Parcs Village which was bought by the Trust in 2007. The land is being developed into a green space to attract native wildlife and for local people to enjoy. 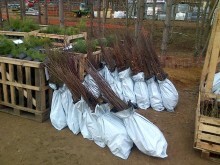 The project is costing around £250,000 in total with the first trees were planted in winter 2011/12. This is part of the Trust’s ongoing work to regenerate the landscape and prospects of the Marston Vale area. 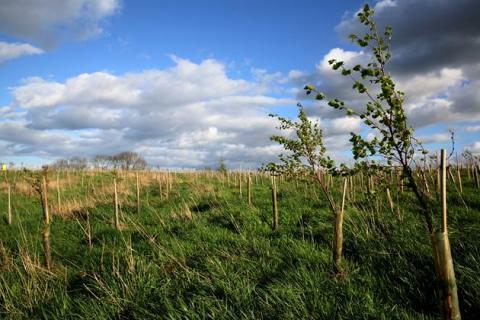 The Forest of Marston Vale Trust have worked with the local community to involve more than 1,000 local people in the planting of 15,000 trees at Folly Wood to transform it from improved farmland into an area which will be home to local wildlife. “The funds that Center Parcs have provided us with have enabled us to not only organise the planting in this area but to also engage the local community. Without the help and support of Center Parcs, this project wouldn’t have been possible. It’s not just about the money though, it has been great to have a brand like Center Parcs supporting a local environmental project as this has encouraged further financial support from other sources. “There’s such a strong synergy between our cause and what Center Parcs are about. Their business model is based on using the appeal of the natural environment to create great leisure destinations which give people contact with nature whilst boosting the local economy in many ways. Our work to create the Forest of Marston Vale is about doing something pretty similar, as we’re using major improvements to the environment to transform the landscape and prospects of the Marston Vale. It’s a genuine and natural fit, and why we’re proud to work with Center Parcs. For the local community, this means they have another area of natural green space on their doorstep, for people to enjoy for many years to come”. Creating the Forest of Marston Vale is about using trees and woodlands to repair a damaged landscape, addressing the effects of the brick making industry, which had flourished for over a hundred years between Bedford and Milton Keynes. The headline target is to achieve 30% tree cover by 2031, but trees are just the tool to deliver the aim of environmentally-led regeneration, providing social, economic and environmental benefits both now and into the future. Such a bold and long-term vision takes dedication and commitment to turn it into a reality. The Forest of Marston Vale Trust was formed to do just this – a small, passionate organisation with a clear focus on creating the Forest. As the independent registered charity (no. 1069229) responsible for leading the creation of the Forest of Marston Vale, their work involves a wide range of things, from tree planting to the operation of their Forest Centre & Millennium Country Park at the heart of the Forest. The Trust’s work is guided by the Forest Plan, a document that sets out the 40 year strategy and objectives for creating the Forest of Marston Vale. The Forest is a landscape-scale and long-term project and, whilst planting millions more trees is at the heart of the vision for transforming the Vale, there will be other changes too, as the area continues to be a dynamic one. The future of the area is difficult to predict, but as the creation of the Forest of Marston Vale continues, local people can be certain that this once degraded part of Bedfordshire will become increasingly well-wooded, attractive and a much richer environment for people and wildlife. The Center Parcs concept is to provide short breaks in the forest, bringing families together and back to nature with high quality accommodation, a range of outstanding leisure facilities and over 100 activities, all set within a protected and enhanced woodland environment. Center Parcs operates four Villages in the UK; Sherwood Forest in Nottinghamshire, Elveden Forest in Suffolk, Longleat Forest in Wiltshire and Whinfell Forest in Cumbria and has a fifth Village, Center Parcs Woburn Forest in Bedfordshire, due to open in spring 2014. Each Village is set in 400 acres of natural woodland, with trees, streams and wildlife surrounding Apartment and Lodge accommodation. At the heart of each village is the Subtropical Swimming Paradise, an extensive range of restaurants, cafés and retail outlets, plus, Center Parcs’ own Aqua Sana spa facility.